From the back of the car park, the walk follows the ‘Flint and Steel Track’ sign along the bush track heading down through the bush. 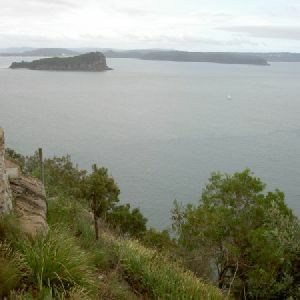 The walk drops down some stairs and turns right at the old ‘Ku-ring-gai Chase National Park’ sign, then left down the side of the hill. 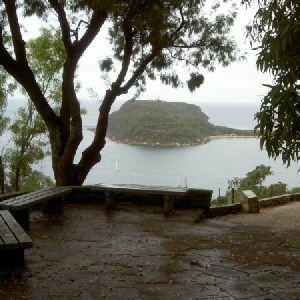 After about 100m, the walk continues down a set of stairs and then down the bush track to the signposted intersection. 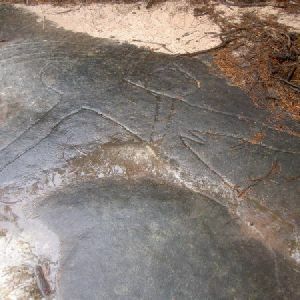 Veer left: From the intersection, this walk follows the ‘Flint and Steel Bay’ signpost along the defined bush track. The walk passes a water collection cave on the left, and continues down the valley to the McGaw Ruins. 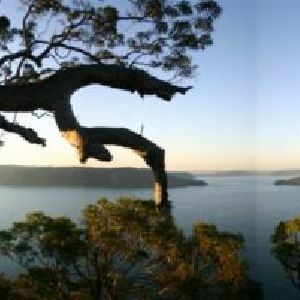 The McGaw ruins are situated north-west of White Horse Beach, on West Head in Ku-ring-gai Chase National Park. 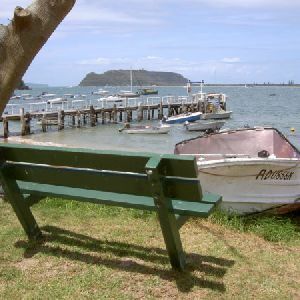 The property was originally owned by John Miller, who also owned large areas of West Head. The property was sold to Mr Eardley McGaw in 1928, on the condition that he built a house there. 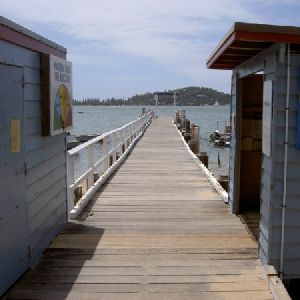 Mr McGaw built a two-storied house with several other smaller buildings, including a wharf. 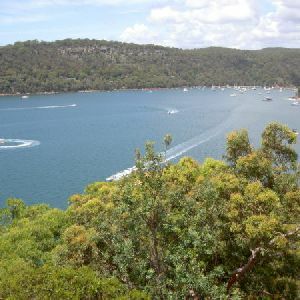 Mr McGaw and his wife lived there until he became ill, when they moved to Narrabeen and NSW National Parks took over management of the land. The house and other buildings were lost during a 1971 bushfire, leaving the sandstone foundations and ruins to be grown over with vegetation. 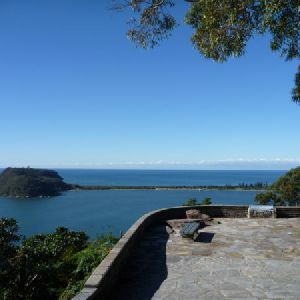 Turn left: Keeping the Hawkesbury River to the left of the track, this walk follows the waterline away from the beach and along the shore for a short while before coming to the unsignposted McGaw ruins. 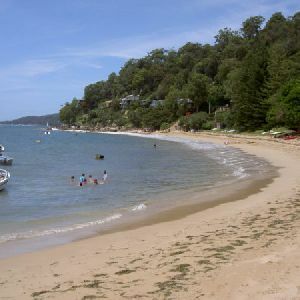 White Horse Beach, Ku-ring-gai Chase National Park, is a 30m stretch of sand sitting on the coast of Flint and Steel Bay between rocky boulders. 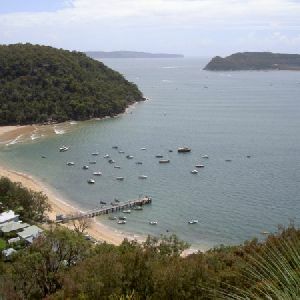 The beach, backed by a steep hill, provides north-westerly views over the Hawkesbury from Patonga, Broken Bay Sport and Recreation Centre and up the river towards Brooklyn. Around 560m of this walk has short steep hills, whilst the remaining 370m is very steep. Around 600m of this walk follows a rough track, where fallen trees and other obstacles are likely, whilst the remaining 330m follows a formed track, with some branches and other obstacles. Around 600m of this walk has minimal directional signs, whilst the remaining 330m is clearly signposted. Around 600m of this walk requires some bushwalking experience, whilst the remaining 330m requires no previous bushwalking experience. This whole walk, 930m is not usually affected by severe weather events (that would unexpectedly impact safety and navigation). This whole walk, 930m has limited facilities (such as not all cliffs fenced). 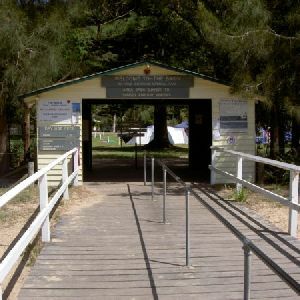 A list of walks that share part of the track with the Flint and Steel Bay (to White Horse Beach) walk. 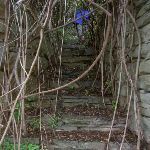 A list of walks that start near the Flint and Steel Bay (to White Horse Beach) walk. 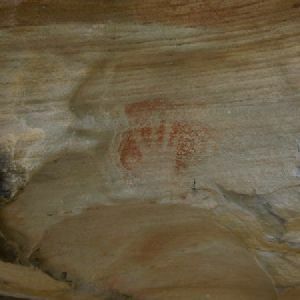 http://new.wildwalks.com/wildwalks_custom/includes/walk_fire_danger.php?walkid=nsw-krgcnp-fasbwhb Each park may have its own fire ban, this rating is only valid for today and is based on information from the RFS Please check the RFS Website for more information.